A group claiming to be the IRA has said it sent suspect packages to army careers offices last week. The Metropolitan Police said the group made the claim to a media organisation in Northern Ireland on Saturday using a recognised codeword. Four suspected explosive devices were sent to offices in Oxford, Slough, Kent and Brighton last Thursday. Days earlier letter bombs had been delivered to offices in Hampshire, Kent and Berkshire. A statement from the Metropolitan Police said: "We are aware of the claim of responsibility for the devices that were sent to army recruitment centres in England last week. "The claim was received on Saturday, 15 February by a Northern Irish media outlet using a recognised codeword. "The claim was allegedly made on behalf of the 'IRA'." Last week Downing Street said the small but potentially viable devices carried "the hallmarks of Northern Ireland-related terrorism". A spokesman for Number 10 said Royal Mail and staff at all military bases had been warned to stay "extra vigilant" and screening procedures for mail sent to armed forces offices was being reviewed. Police have also asked the public to report anything suspicious to the anti-terrorist hotline. The packages found on Thursday were at offices in St Giles, Oxford; the Queensmere Shopping Centre in Slough; St Peter's Street in Canterbury and Queens Road, Brighton. They were safely dealt with by police and bomb disposal experts. 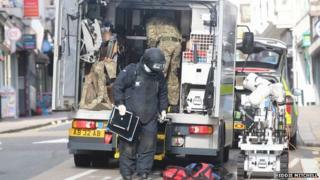 Police believe they were linked to letter bombs sent last Tuesday to careers offices in Chatham and Reading. A device was also found at the office on Hospital Hill, Aldershot. The packages were forensically examined after being made safe. Det Supt Stan Gilmore, of the South East counter-terrorism unit, said: "Even if the contents are determined to be a viable device they pose a very low-level threat and are unlikely to cause significant harm or damage."